A Rinkya Blog: Takeru Kobayashi is Defeated in Nathan's Hot Dog Contest! Takeru Kobayashi is Defeated in Nathan's Hot Dog Contest! 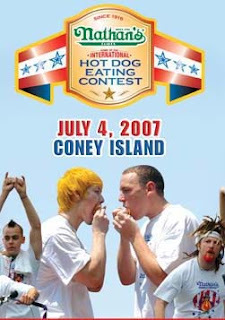 (one every 10.9 seconds) at the famed Nathan's hot dog eating contest in Coney Island. Kobayashi, the 6 time champion, may have suffered a set back due to a recent wisdom tooth extraction and a sore jaw. Kobayshi did perform his best ever in the competition- eating 63 hot dogs, no small feat. This sadly ends Kobayashi's reign as the champion Hot Dog eater. Good Luck to him next year! Smallest Drum Set in World? McDonald's Mega Mac is Back! I-Sobot- World's Smallest Humanoid Robot! Sony & Swarovski Make Beautiful Music Together! Final Fantasy VII 10th Anniversary! Murakami & Vuitton Collaborate Again! Attack of the 59 Foot Gundam! New PSP for Japan- Slimmer and More Colors! OLIVIA Pacific Media Expo Auction! Some R Rated Engrish Found! Nintendo Wii Accessories Exclusively From Japan! 24 Karat Gold Swimwear from Japan! Square Watermelon- Only In Japan!